Mary Nally, Ballyglunin and her brother Sean Cunningham, Corofin. Source: Mrs. Mary Nally, late of Ballyglunin. Ballyglunin Railway Station, in the parish of Killererin, where scenes from the famous film The Quiet Man were filmed. Jack Duffy and his wife Kitty (nee Costello) returning to the United States in the mid 1950s. In May, 1854, a committee was formed to promote the railway line from Tuam by a man in Toghermore House by the name of Robert Henry. Denis Kirwan was appointed Chairman. Committee members were Robert Bodkin of Annagh, Martin J. Blake of Brooklodge, Charles Blake of Tuam, John V. Cannon, Castlegrove, John Stratford Kirwan of Moyne Park and David Ruttledge of Barbersfort. They sponsored a Bill at the House of Commons, London in January, 1858 to establish the “Athenry and Tuam Railway”. The Bill was passed and the necessary finance was raised by issuing 9,000 shares of 10 pounds each. The estimated cost of construction was 6,000 pounds per mile. But this depended on local landowners giving land at special discount rates. Famous engineer William Dargan was appointed in 1859 and work was completed by 750 men in eighteen months. 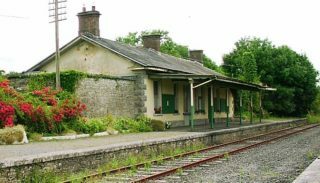 Ballyglunin, also known as Ballyglooneen, was opened in November 1860 as a station for passenger traffic with a single 225 ft. platform on the east side of the track. It owes its existence undoubtedly to its proximity to Ballyglunin Park, residence of the Blakes, as well as Skerrits’ Brooklodge House and Bodkin’s, Annagh House. For customers, such as these, a first class service was provided. Around the turn of the century, Robert Blake would regularly have his evening meal cooked in the Shelbourne Hotel, Dublin and delivered to Ballyglunin station, packed in special ‘hay boxes’, the thermal food containers of the day. A special extra delivery would arrive on the evening mail train if there were guests in residence or a county gathering planned. In 1903 GS & WR were the new owners of the line from Athenry to Claremorris. 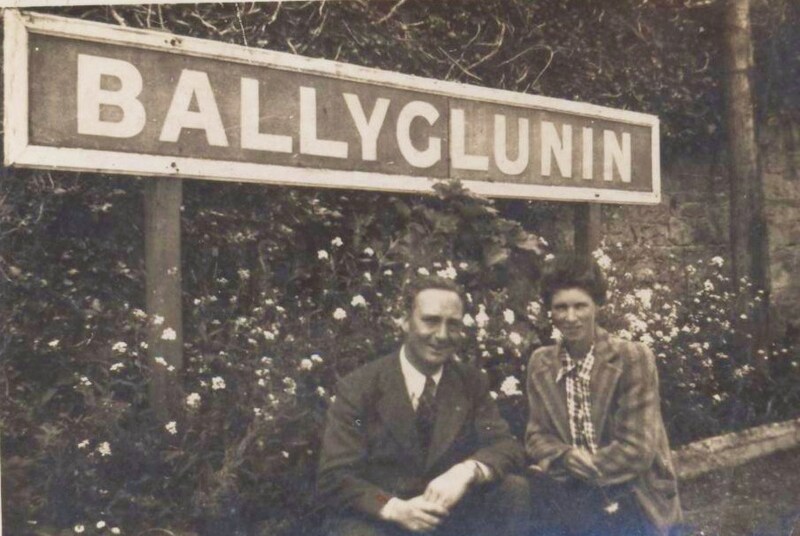 They revamped Ballyglunin and built the west platform of equal length but with a canopy and a single storey residence, waiting room, office & toilets and lamp room (important at the time) and with a footbridge spanning the tracks. The bridge was taken from Clifden and it has now been moved into service in Ballinasloe. The 1903 improvements also included an enlarged goods store, a run-through goods store for two wagons and a cattle loading siding, much used from 1935 to 1975 for loading beet wagons for Tuam Sugar factory. 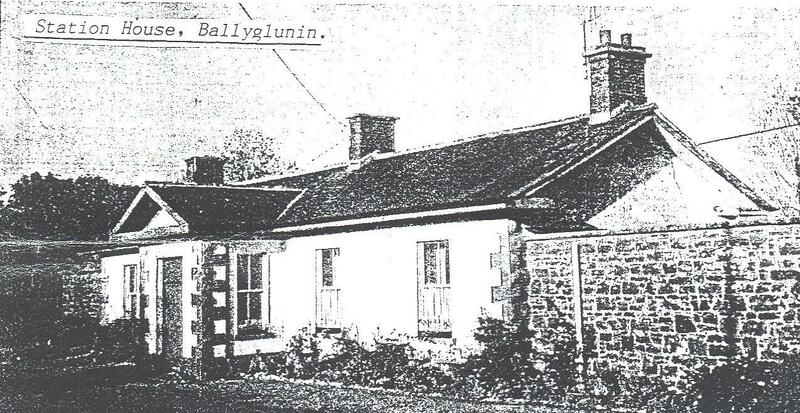 Ballyglunin came to prominence in 1878 with a visit of the Duke of Connaught, the third son of Queen Victoria. Everyone wanted to entertain him. The hunting season was enlivened by his visit and great preparations were made. He was to arrive at Ballyglunin to join the hunt. It was elaborately decorated and a cannon was procured to fire a salute. A premature discharge of the gun caused great excitement and a rush towards the station, but it was found that the salute had greeted a passing goods train and there was no ammunition left to greet the royal train. However by the time the duke arrived, there was a very big crowd gathered to give him a rousing cheer so the gunfire was hardly missed. Another moment of glory was in 1952 with the shooting there of some scenes of the famous film the Quiet Man. It was late June but they were unlucky with the weather and what appears for less that five minutes on the film took almost three weeks to get ‘in the can’. The film opens with the arrival of a returning emigrant by train. 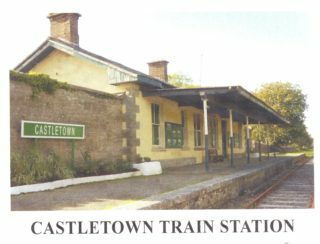 The station was named ‘Castletown’ for the film and a special old steam train with two 1920 type carriages came out from Tuam each day for that scene and for another where Maureen O’Hara newly wedded is leaving by train when hubby, John Wayne rides in and finds her in the last carrriage and drags her away to get her ‘fortune’ from her brother. This second scene caused most trouble and I watched at least six re-takes one fine Sunday, before my patience ran out. But eventually they got the film made and it proved a winner and it did more than anything else to make Ballyglunin known far and wide. The busiest ever Sunday Ballyglunin saw was on the 16th July 1967 when six specials for Knock and five Galway-gound passenger specials went through in the morning and returned in the evening. But only eight days after that, the station was closed to goods traffic re-opening for short periods each winter for the beet traffic until it finished in June 1980. During the Civil War period, Ballyglunin was the scene of several incidents. On the 18th November, 1922, an attempt was made to send a train crewless into Tuam with the regulator open but Free State troops arrived and prevented the dangerous exploit. On the 8th and 14th December, the Limerick-Sligo goods train was raided at Ballyglunin. The items taken included two barrels of Guinness, 56lbs of butter, 5,000 cigarettes, four bags of flour, two sides of bacon and 48 Christmas cakes – no doubt someone was stocking up for Christmas; the goods store being the prime target. 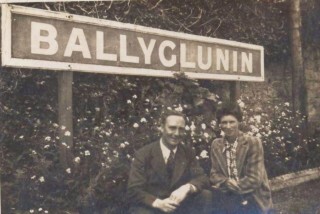 On Christmas Eve the evening mail train was held up at Ballyglunin and the passengers identities checked. These incidents led to the station being protected by an army guard on a 24 hour basis. On 6th January 1923, the irregulars had better luck when they brought the Limerick-Sligo goods train to a stand near Ballinastack by waving a red lamp. The crew was ordered at gunpoint to sit on the ground while a very large consignment of whiskey and bacon was removed from a Tuam sundries wagon and nothing else was taken. Driver Tim Bray was ordered to set the engine in motion and jump off, the guard at the other end was forced to release the hand brake, so that the wagons rolled back on the steep incline towards Ballyglunin. The army were quickly on the scene but the raiders had escaped with the loot. The engine hurtled through Tuam station, taking in its stride the road gates and those at the Galway road but luckily caused no personal injury. The engine careered on till it was derailed roughly where the beet factory was later built as a rail had been loosened there to sabotage another train. During the 1923 troubles, nearly every bridge along the line was blown up, some more than once, but they were usually repaired and back in service in three to four days. These troubled days over things rolled on nicely until the 1940’s when the coal shortage reduced traffic to one train a day which chugged along slowly burning damp turf. 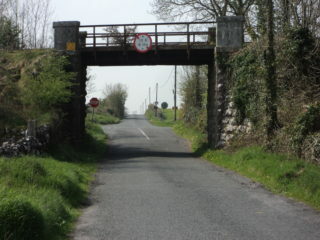 After the war, road transport gradually won the transport war over rail so that now branch line stations like Ballyglunin stand quiet and silent. But in the case of Ballyglunin, there are many happy and thrilling days it can remember. 1957 £. s. d. Pounds, Shillings and Pence.